Steel Rats looks like really quite unique and ridiculous experience and it's heading to Linux this month. Developed by Tate Multimedia, the same folks behind Urban Trial Freestyle. Back in December last year I noticed it popping up on SteamDB but the developer wasn't commenting at all on it. Just today, that changed as they posted on Steam directly that a Linux release has been scheduled for February 20th! Race, shoot, stunt all for the price of one! Now for something a bit different. 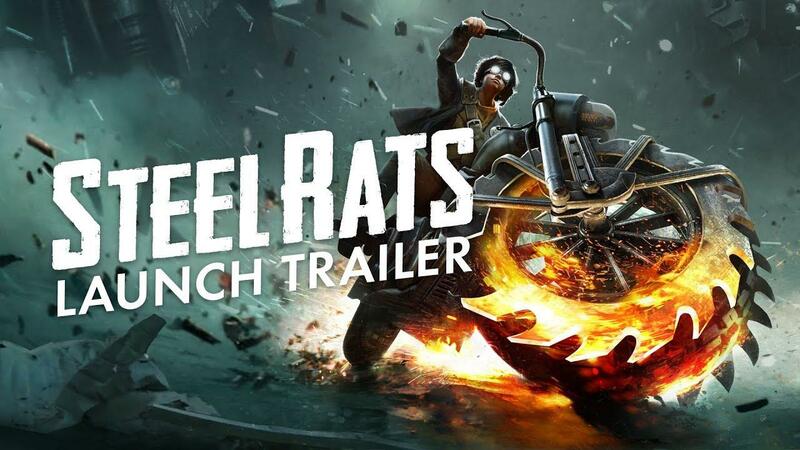 Steel Rats™ blends genres in a way no game has before, infusing 2.5D stunt bike, racing action with precise platforming and intense vehicular combat. Drive and destroy! Your motorcycle is your weapon in the fight against an invading horde of alien Junkbots. Combine up close melee combat and precise, deadly shooting with a ludicrous vehicular arsenal including wheel-mounted saw blades, harpoon guns, flame spewing exhausts. We’re sure you’ll find some juicy ways of using these tools to wreak havoc on your enemies. Ride with style! Start your engine and master the realistic physics based controls of your bike to perform stunts and skillfully destroy Junkbots with a barrage of special abilities and weaponry. The more creative the destruction the better, ride up walls, backflip of the side of buildings and unleash havoc mid-air whilst riding upside down. Dash and explore! Discover the secrets of Coastal City and reveal the mystery of the Junkbot invasion. Explore each level, find every collectible, unlock new areas and dominate the leaderboard. You can find it on Steam and GOG. Great news ! I didn't know this game, i think, but from what i've read and watched it seems really nice. Thanks, I did search but GOG showed nothing, odd. I'm generally not a side scrolling kind of guy, but this looks terrific. Say what one will about AAA titles or lack thereof, but is it my imagination or, in the last several weeks of GOL coverage, does it appear like we're getting an avalanche of fun looking new or significantly updated games? If not for the Steam Wishlist, I'd have trouble keeping track of everything! Nice! Developers promised the Linux release a while ago, good to see they are finally going to do it. Oh. This is neat, man. Kinda bummer that it's only single-player. I was hoping for a Vigilante 8 (or Twisted Metal) type of game mode. iiari I'm generally not a side scrolling kind of guy, but this looks terrific. As a bearded bike-riding Linux gamer interested in sci-fi/steampunk biker-fighter-shmup crossovers... I approve.